"Wonderful for brunch or even as a light dinner. We have this every Christmas morning!" Mix chicken, red bell pepper, spinach, Cheddar cheese, mayonnaise, lemon zest, salt, and nutmeg together in a large bowl. Set aside. Unroll crescent roll dough, and separate into 16 triangles. Arrange triangles in a circle on a 13-inch baking stone or pizza pan with the wide ends of the triangles overlapping in the center and points facing out. The center diameter should be about 5-inches. Scoop chicken mixture evenly onto the widest end of each triangle. Bring the outer point of each triangle towards the center of the circle and tuck the point under the wide end of the dough. The filling will not be completely covered. Bake in the preheated oven until golden brown, 20 to 25 minutes. Slice and serve. For maximum flavor, use sharp cheddar cheese instead of a mild or medium cheese. I *cannot* believe that no one else has tried this recipe!! It is SO EASY and SO GOOD, it was one of the first things to go at my dinner party. Will make this again. VERY easy, and so tasty! I used frozen chicken that I cooked and shreaded instead of canned. I will make this again! 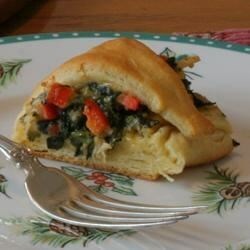 Great recipe-my friends and family including a picky husband really liked this. This recipe is simple and speedy! Taste great. I use this as a light dinner or lunch. 6-stars!